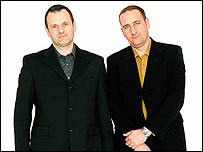 DJs Mark Radcliffe and Marc Riley, aka Mark and Lard, are to leave BBC Radio 1 for sister stations. Mark Radcliffe will join Radio 2 later this year while Riley will move to digital station 6 Music in April. Radio 2 and 6 Music controller Lesley Douglas said: "I've been talking to them for a long time and I'm delighted to have secured their talents." Their afternoon slot on Radio 1 is expected to be filled by Colin Murray and Edith Bowman in the spring. The Manchester duo have been on the station as a duo for more than 10 years and built up a cult following with their support for alternative music and their offbeat brand of humour. In 1997 the pair took over the breakfast show from Chris Evans before moving back to their regular afternoon slot. A spokesman for the station said: "Mark and Lard have had a fantastic 10 years on Radio 1. We wish them well in their new homes." They are the latest DJs to leave the station, which has gone from a more rock-oriented schedule in the 1990s to be dominated by the rise of urban music. Many DJs like Chris Evans, Steve Lamacq and Zoe Ball - employed to replace veterans like Dave Lee Travis and Simon Bates - have now been moved from daily shows or left the station altogether. Jo Whiley is now the longest-standing daily presenter, with 11 years at the station. Radcliffe began his career as a radio producer, first moving in front of the microphone when Radio 5 launched in 1990. He joined Radio 1 in 1991 and was soon given a daily late-night show on which Riley was a regular guest. Riley, a former member of rock group The Fall and music press officer, became Radcliffe's sidekick and the pair were given the prestigious breakfast show when Evans left. Together, they won three gold Sony Radio Awards - the industry's most prestigious accolades - between 1998-2001. They currently host the 1300-1500 weekday slot, but are on a break from the show this week. Riley said: "We have been sat at opposite ends of the table shouting at each other for 10 years now and the plan has always been that once we were finished at Radio 1 we would go our separate ways. "Luckily we stumbled across Radio 2 and 6 Music." Ms Douglas said it made "perfect sense" for them to move to Radio 2 and 6 Music. "I have been discussing this with Radio 1 controller Andy Parfitt for some months now and I am pleased that BBC Radio can provide a home for such exceptional presenters."